﻿ Отзывы покупателей о нашем питомнике и собаках Чирнеко дель Этна. Getting a puppy from Diana was the best decission I could ever make. Indy is my first dog and I'm very happy I have chosen Diana's Cyrenensis. Indy is very gentle, delicate, but definitely not shy. She is full of joy and she is learning very fast. I was waiting for Indy 10 months and at this time I had excellent contact with Diana, she was answering all my questions and sending us a lot of images and videos of growing puppies. You have to know that her puppies grow in natural environment playing with each other, she's not keeping them in cages or far from people. She teached them how to sit, give paw, high five, walk on leash, cut claws, clean their ears. They are teached how to sit and wait for food very calmly, not jumping at you while preparing food. I have to thank Diana very much for such wonderful puppy - she had made my dream came true. Thank you for Indy! Since Friday morning dec 21st, our family is expanded with Ivo. (Ivano). Ivo is born on August the 31st. He is a lovely male Cirneco. But how did we meet this kind of breed? We went for our holidays to Sicily from May 23rd till June 6th. We read a lot before going to Sicily, also about a special breed of dogs. 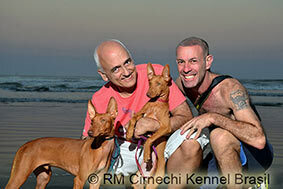 On our stay we met an Cirneco at the beach and it seemed that is was love at first sight. We decided to look for a breeder and we found the website of Diana. I send her an email and asked if we could visit her to meet her Cirnechi. June 1st we met Diana and Gino in Bronte. We were very welcome in the residence of Diana and Gino. We were touched by their warmth and hospitality. Her Cirnechi were very kind and enthusiastic towards us. Diana her website is very complete and she told us a lot about her dogs. The love at first sight on the beach was real after meeting Diana her Cirnechi. Diana told us that maybe she would have a litter this year but she did not decide yet which couple she would bring together. That was not a problem for us. We told Diana we were patient and it was no problem for us to wait. So we were pleasantly surprised that Diana told us end of June that Era was pregnant. Diana kept us informed during the pregnancy of Era and August 31st, the puppies were born. Diana kept on sending us photos of the puppies and on sept 19th we made out choice for Ivo. Because Ivo had to come to the Netherlands, we had to wait until he had the age of 15 weeks before we could close Ivo in our arms. Diana did a great job the time Ivo was with her. She learns the puppies already a lot of things, she socialises the puppies, learns them to walk on the leach, learns them to sit, to let them know that NO is also an answer and gives them love and warmth. It’s very nice to buy a dog from someone who work with so much love and kindness with her dogs. And who spends so much time on the new owners of her dogs. The journey to out home was perfectly arranged by Diana. The courier brought Ivo save on our home address. 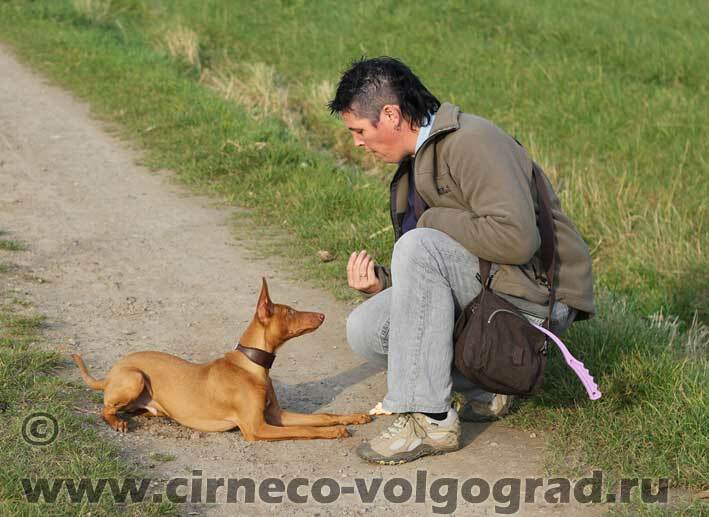 Ivo is an kind, enthusiastic and intelligent Cirneco. We are very happy with him in our family. Diana, thank you for all the time and work you put in Ivo. The love and warmth you gave him. We are very happy that we met you and your dogs. We will keep you informed about Ivo. One month has passed since Cyrenensis Eroe, my Hero, entered my life and filled it with joy. An affectionate and courageous boy, playful and active outside, tender and calm at home, friendly to everyone, with an endless desire for training.When we met, he was already perfectly socialized with people and animals, he knew several commands, was trained to toilet outside. It’s easy to travel with him, he never becomes annoying at restaraunts, never begs for food — he knows almost everything that a young gentleman must know! And it’s a true pleasure to teach him more and more. Since our first conversation Diana directed and supported me with valuable advices, interesting stories and useful information. I found a new friend and a teacher who helps me to become a better owner for my pup. Each one of her puppies is a true piece of art, a priceless contribution to this ancient breed, but her attitude towards new owners is also a rare and admirable example of humanity and responsibility. She doesn’t make business, she makes the world better. I wish Diana every success and I express my immense gratitude for raising Eroe, my fearless noble friend, my little extraterrestial. :-) We both send greetings to the blessed land of Sicily and to the wonderful family of Cyrenensis. VITO is the third dog who comes to join our pack. And he is the third of our dogs who will enjoy the world of flyball, following the foot-steps of his big (Cirneco) brother Ezzo (6 years old). He is our second Cirneco of kennel Cyrenensis. I have asked Diana a brave, and self confident boy, one who is the first to discover new things, without being dominant. Because bravery and dominance usually are an inseparable pair, as Yin & Yang, I knew it was not an easy question. Vito meets our expectations, and even more, he is brave and self confident, in a playful manner. He doesn't show any signs of dominance, he is friendly and kind to everyone he meets, both dogs as people. A super social cirneco. To have his nails cut, to have his ears cleaned or to check his teeth is a piece of cake and evident for Vito! I want to thank you Diana for all the work and time invested in our Vito! And I am very happy all puppies were raised on BARF, why? I am personally against feeding dry or processed dogfood! My two dogs are already on a BARF diet, so it was easy, Vito joins the festive meals without having to adapt to another way of feeding. We are very happy with our little Kangourou! Big thanks Diana!! Vito is zelfs meer dan ik gevraagd heb, dapper en stoer op een speelse manier. Niets van dominantie een echte allemansvriend zowel naar vreemde honden en mensen. Een super sociale Cirneco, nageltjes knippen oren uitkuisen tandjes nakijken is allemaal vanzelfsprekend voor Vito, daarvoor mijn dank Diana voor al het voorbereidend werk en tijd dat je in onze Vito hebt gestoken! En heel blij dat alle puppies BARF kregen om te eten bij Diana, waarom wel om deze personlijke reden ik ben tegen hondenbrokken! Daar mijn twee andere honden al BARF eten was dit heel gemakkelijk, Vito kon hij lekker mee aanschuiven, zonder dat hij zich moest aanpassen aan een andere voedselmethode ! Heel blij met onze kleine Kangoeroe merci Diana !! Hopelijk zien we elkaar snel terug!! It has been four weeks since we brought Cyrenensis Cesare home and we could not be happier. We call him Bronte, and he has adjusted very easily to life in Milan. He is excellent on the leash, and has made many friends in the dog parks near our apartment. He is healthy, loving and energetic, and we are so pleased that we found Diana and her puppies. 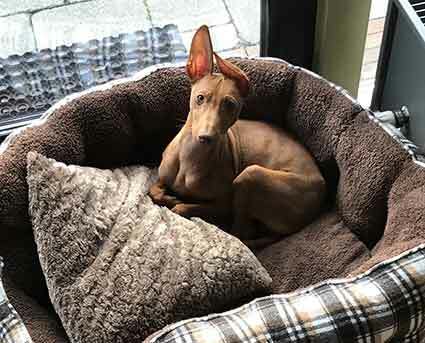 We had previously owned a Pharaoh Hound, so had some experience with sight hounds, and wanted something similar but smaller. The Cirneco dell’Etna was the perfect choice. Intelligent, friendly and absolutely fascinating to look at. They are truly a remarkable and beautiful breed. Since we are currently living in Italy, we had the opportunity to fly to Catania and then rent a car and travel to Bronte. Diana met us for coffee, and then we went to spend time with the puppies, and their mother (and grandmother!). It was really a great experience, and we felt extremely fortunate to physically select our puppy from the 5 that were still available. It was not easy, as they were all so wonderful! We spent the next two days exploring the area, which is very scenic, and visiting with the puppies. Diana answered all our questions, and helped us to decide which puppy would be the best fit for us. Diana is the most dedicated and professional breeder I have ever met. She is super passionate about Cirnechi, and she is doing the breed and its admirers a great service with her work. We hope to get another Cirneco before leaving Italy, and look forward to visiting Diana and her amazing Cirnechi again soon! We are thrilled to share our joy and happiness as we found our new family member – Cyrenensis Caramella. We also wanted to share appreciation for all the attention Diana gave to our family answering our countless questions and guiding us through the adoption process. When we were considering adding a new member to our family, we considered many breeds. We had talked at length about which breed and temperament would be the best fit. We had seen a couple of Cirnechi and met a couple of owners and breeders at a local dog show and we were certainly intrigued by the breed. We found Diana’s website to be extremely useful and informative, and helped us to confirm this was the right breed for us. 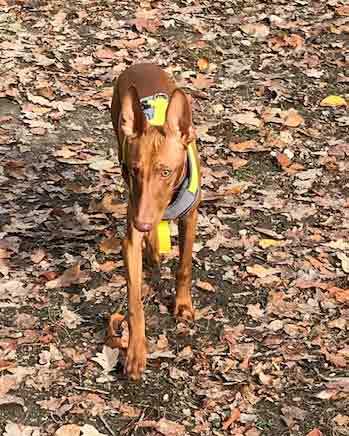 During our search and decision process, Diana was quick to respond to our many questions and concerns, and provided invaluable information to us regarding the breed. Her responses were insightful and comprehensive with details and even included videos to help illustrate important points. Caramella came to us as a very happy well-adjusted puppy that adapted to our family and lifestyle with incredible speed and ease. It was clear that she received a LOT of attention and training before she even arrived at our house. She responds to every training opportunity with excitement and is always eager to learn more. She is amazingly smart and so full of love! It was evident that she was well socialized with a variety of people and dogs. She was also accustomed to various grooming techniques including nails and ear cleaning. Basically, all of this made the transition to her new home as smooth as can be and we are so truly happy! 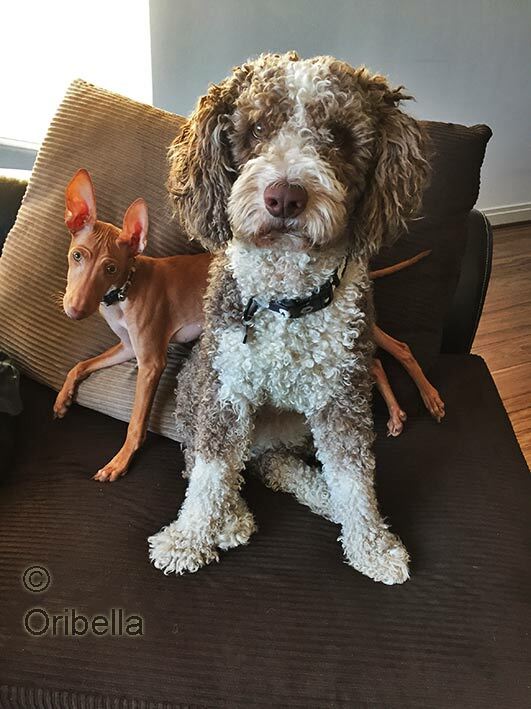 We are so incredibly excited to have Caramella as part of our family, and when we are ready to give her a little Cirneco brother or sister, I am sure Diana will find a perfect match for us! Per toeval kwamen we op de websites terecht van cirneco dell’etna. Een foto van een klein hondje trok meteen de aandacht van ons. Toen zag ik Sicilie staan, heel ver van ons vandaan. Ik dacht nog dit is niet realistisch!! Maar toch heb ik gemaild en kreeg heel snel bericht vanuit Sicilie. Op dat moment ontstond het contact met Diana een zeer hartelijk persoon, er ontstond meteen een band via mail. Vanaf dat moment wisten we dat we met iemand te maken hadden met het hart op de juiste plaats met veel liefde voor honden. Dit gaf ons meteen vertrouwen!! (tenslotte nog nooit via het internet een hond gekocht). Het wachten duurde lang, voordat onze hond die de naam Silas ging krijgen naar Belgie kwam. Maar we werden goed op de hoogte gebracht door Diana met foto’s en filmpjes. Wat werd het spannend, het moment dat ze met het vliegtuig overgevlogen werd vanuit het warme Sicilie naar het koude Belgie in een Benche bij de passagiers. Vanaf het moment dat ze aankwam samen met haar begeleidster en de benche ging open was het liefde op het eerste gezicht. Silas was al goed gecocialiseerd en met al de cadeautjes en met een prachtige hond zijn we terug naar huis gegaan. Nu inmiddels 5 weken later is Silas niet meer weg te denken bij ons. Iedereen is gek op haar, op de manier hoe ze kijkt, beweegt en opgewekt is. Een heerlijk karaktertje. Als we terug kijken op het verloop van het traject om Silas naar Belgie te halen, kijken we met veel plezier op terug. Diana is geweldig, en je kunt haar alleen maar in het hart sluiten. Als we naar Silas kijken zien we ook een stukje van haar. Ik kan iedereen dit aanraden, heel bijzonder. 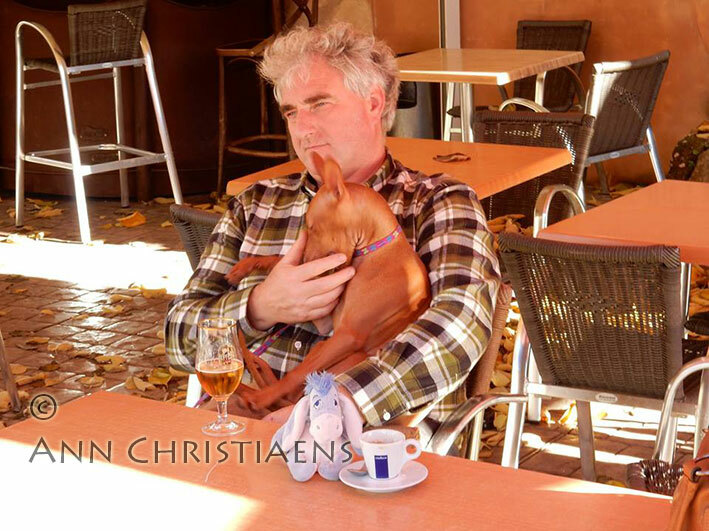 Wij kijken er naar uit om volgend jaar met Silas op vakantie te gaan waar ze geboren is in Sicilie om Diana te ontmoeten en om te lkaten zien wat voor een prachtige hond Silas is. Veel groetjes uit Belgie Pascal en Marcel. We had wanted a cirneco in our family for some time; and had really done our research. Kennel Cyrenensis and Diana stuck out from the moment we found them! Diana was wonderful in all communication . She always got back in a timely manner and answered any questions we had. She is truly brilliant about this breed. We ended up choosing a beautiful girl, Catania. Diana sent all kinds of photos and videos , and we just had to add her to our family. Diana made the whole process effortless. From begging to end everything was perfect. Catania was shipped carefully by courier to our home in California. Diana made everything so comfortable for her and for us! She is an incredible dog! She listens, knows her commands, is beautiful and gentle. Everything we ever hoped for! Diana went above and beyond for our family. 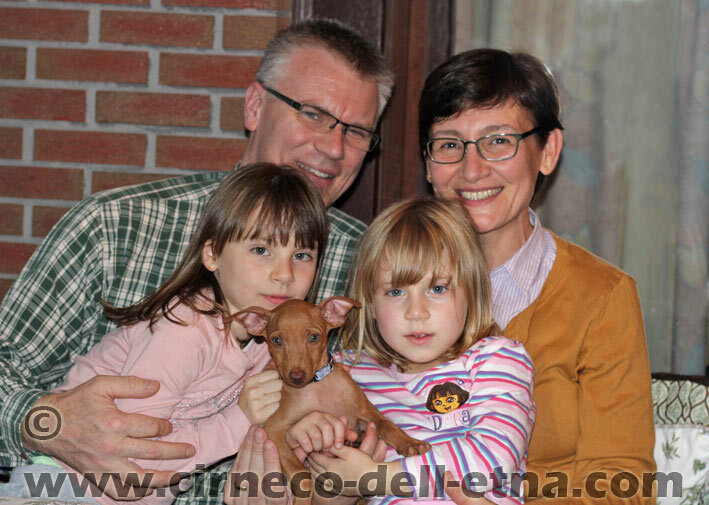 And when we add another cirneco to our family, we will always be coming to kennel Cyrenensis. Without a doubt the most beautiful and seamless adoption. Thank you Diana for making our little family complete! 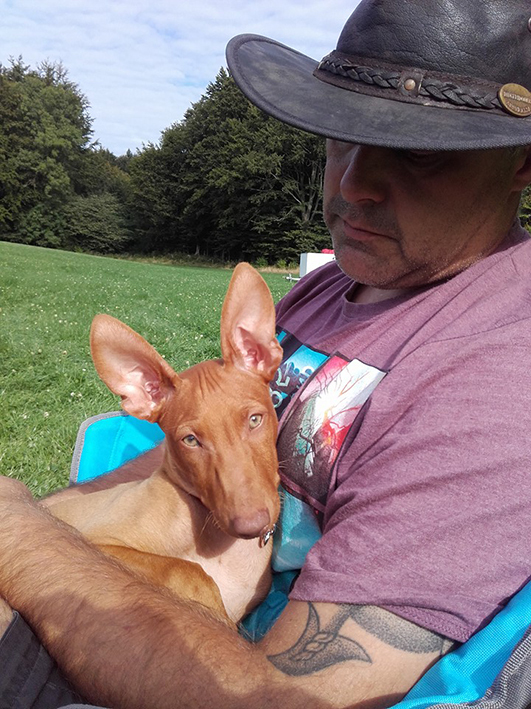 We already had 1 Cirneco from a breeder in England and wanted to add another to our family. As dogs, Cirnechi are fun, lively and full of character. After researching European breeders and discounting some, I found Diana's beautiful web site and spend hours going through every page of it. The web site really does prove how much Diana loves the breed, her explanations and descriptions are truly wonderful. 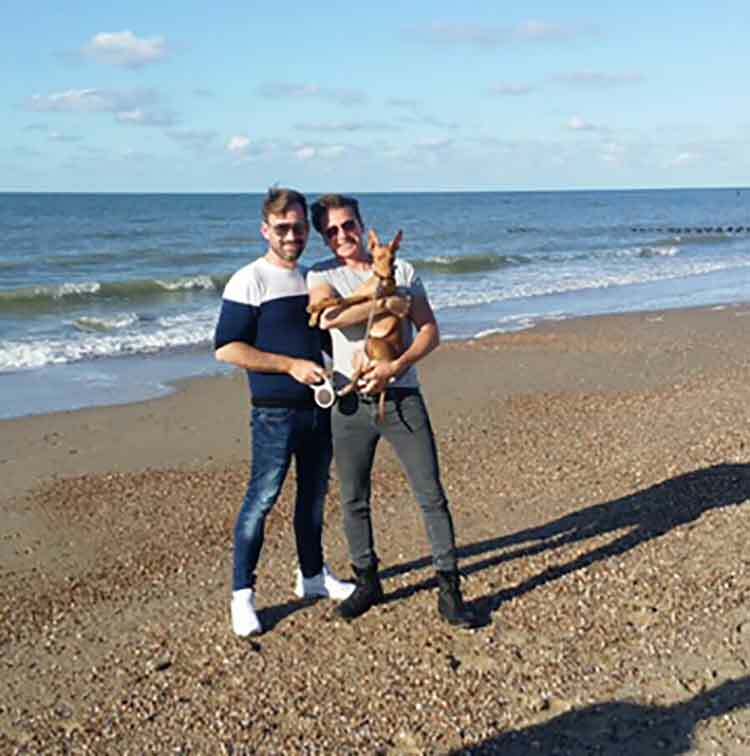 After communication with Diana and her finding out about us and if we were suitable to care for one of her amazing dogs and deciding if the puppy would fit into our multi dog household, Diana made all arrangements for the new baby to come over to us in UK. Her thoroughness and dedication was outstanding. Our new baby came safely over to us by courier who brought her straight to the door, safe and sound. As for the puppy, Cyrenensis Brezza Marina, she is a lovely, cuddly confident little girl who has fitted perfectly into our family and with the dog pack. I really couldn't have wished for a more perfect professional experience of getting a puppy from Sicily. The home of Cirneco. Some 7 months ago we decided it was time to find a new member of our family. We had talked a lot about which breed we wanted. We had seen a Cirneco at a dogshow and thought it to be a very interesting breed to have. 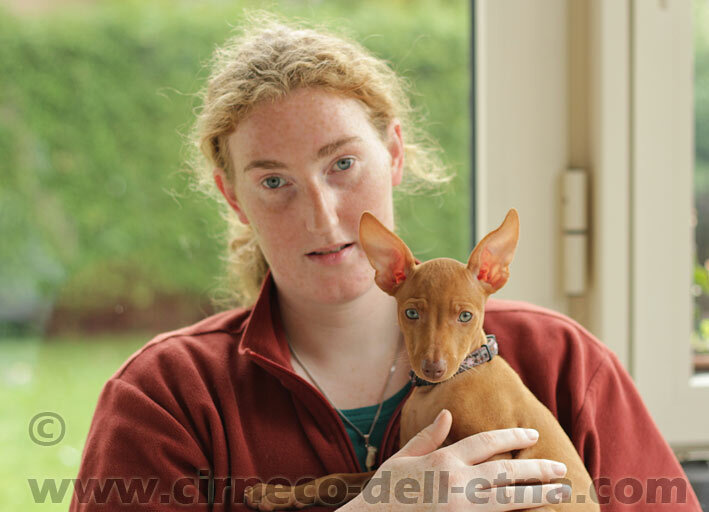 We met some owners of Cirneco and was intriged by this breed. Well, 7 months ago we searched for breeders of Cirneco and Diana appered. We send an e-mail with some (read: a lot!) of questions. Diana had puppies at the time, but they were all asked for. Luckily she had plans for a litter later this year. A lot of mails and pictures of pregnancy and puppies followed. Whenever we had a question, Diana replyed quick, we felt well taken care of in the process. When the first pictures of the puppies came by e-mail, we at once had a favorite. But we had to wait 7 more weeks before Diana decided which puppy were the right one for us. We were very happy that she chose the same puppy as our favorite. We even had the opportunity to name the puppy! So her name is: Cyrenensis Bahira Aquila. Now came the challenges of getting Aquila to Denmark, all the paperwork had to be in order, a courier failed to deliver, so tickets had to be booked.... We decided to travel to Sicily and get her ourselves. This might be the best choice we made. I was picked up in the airport, we drove to a very cosy hotel, which Diana had booked for me, had dinner and a very nice evening together. In the morning I was picked up at the hotel and went to see Dianas dogs and puppies. It was very interesting to see how Diana works with her dogs. And she does work hard training. At the age of 11 weeks Aquila is able to walk on a free leash, calm down on command, walk calmly in a crowd and pay no attention to traffic and other noisy things. Aquila has the skills and mentally strenghts as a far older dog! Well, we spend the day on Etna, in Catania and last in the airport. Aquila behaved very well. In the airport Diana was very helpfull everything was taken care of so I had the easiet checkin ever. After 3 hours of flying we landed in Copenhagen. Aquila was a little anxious but she settled down when she met the rest of the family. At home Aquila invaded our home and hearts! Our other dogs is well together. It is clear that Diana has introduced her puppies to other dogs. All in all, it will be difficult to find a breeder that put so much effort in her work and who will help you as much as Diana does. We will consider Diana and her family friends for lifetime. I wrote a letter to Diana and Cyrenensis kennel, six months ago, to follow a child dream: that was have, one day in my life, "Oriental" or "Egyptian" dogs - Cirnechi have the perfect size -, to live togheter with me an my partner Marcio and our Oriental cats, here in São Paulo, Brasil. 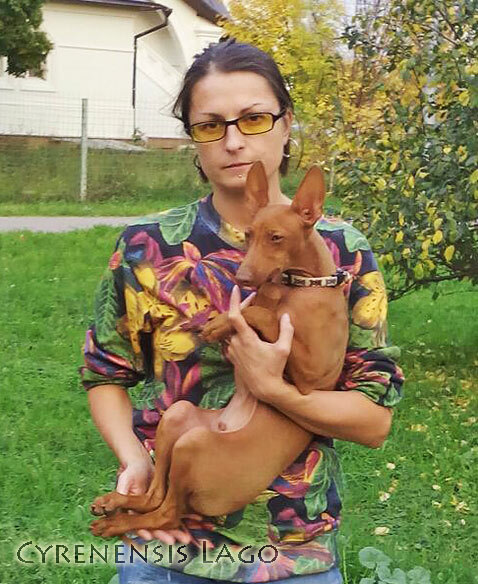 From the first e-mail answer to the last, Diana was an angel, a professional angel that firmly guide us, in this new way for us, the dog way, and, in the world of dogs, the Cirnechi life. We really could understand how this world works by Diana words. She really knows the breed. Anubis entered in our life with some days of age and Diana oriented our choice from the fist day: how the little puppy grows, what we have to do for this, how were the basic types of Cirnechi dogs, how these types appears in the puppies and how they were in adult dogs, how works the barf (bones and raw food: today, in our house, until the cats follow this diet), how the Cirnechi colours and ears grow in puppies development. Real lessons and explanations that passed security to us in this new classroom, new students from a kind and human teacher. Yes, because Diana puts love in her activity of breeding Cirnechi and hands on this. Moreover, Diana helped us to choice the new female puppy partner of Anubis, Neftis, from the unique Cirnechi kennel in Brasil, Pamer's, of Patricia Mendes. And moreover, to transform this dream in a real thing, Diana worked hard and clearly in all the detailled process to ship a dog from Italy to Brasil. And when this process was clear to us that the best way to ship Anubis would be one of us pick up him in Catania, Diana was the best hostess we could dream. Diana and Gino received Marcio (and went along him) at Catania's airport, helped and gave him security in all necessary. And opened their world to Marcio, showing him Anubis, all the dogs, the Etna, Taormina... and sending with him the best Sicilian candies I had taste! I have today a great friend in Cyrenensis, Bronte, Sicily. And one day I will know her personally. Thank you for all, Diana. Bruce is de perfecte hond voor ons gezin. 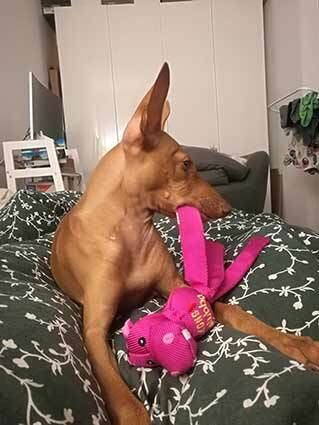 Hij beweegt en speelt graag, maar hij kan ook echt rustig zijn, hij knuffelt ongeloofelijk graag. Hij is hier o zo gelukkig en blij (en wij ook !!! ). Hij voelde zich meteen thuis bij ons. Hij is dolverliefd op onze dochter van 9, hij wacht op haar aan de deur om buiten te gaan spelen. Zijn eerste nacht is super verlopen. Hartelijk dank voor de cadeautjes die je mee gaf en nog eens dank voor je fantastische werk met de puppy's. De kans is groot dat we nog een vriendinnetje in huis halen voor Bruce als hij een jaar of 2 is. Bedankt voor al de foto's en hartverwarmende mails waar we altijd zo naar uitkeken . Bruce is als een nieuw kindje in ons gezin bijgekomen,wij gaan hem al onze liefde,warmte en gehoorzaamheid meegeven. Hij is nu ons zonnetje, ons prinsje in huis ! Het was liefde op het eerste gezicht . Superblije warme groetjes van ons ganse gezin !!!! 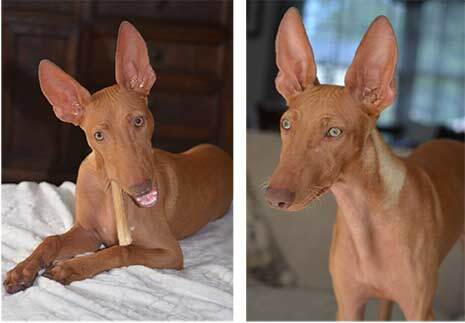 While searching the web to find a second bundle of joy for my household, I came across the mysterious breed of Cirneco dell’Etna. I had never encountered this breed before and was immediately attracted to it. Not many Cirneco live in the United States, so finding out more about this breed was very difficult. I did some more browsing and Diana’s Cyrenensis kennel popped up… this is where I truly fell in love. I emailed Diana to ask a few basic questions and promptly got a response giving me everything I needed and more. At the time, the kennel was in between litters and there were no puppies for sale. But Diana is amazing and kept me in the loop - we emailed stories about our dogs, spoke about plans for the future puppies, and she taught me all about the beautiful Cirnecci. After 6 months of emailing back and forth, the famous Ambra had her puppies. I received pictures of each female pup until Diana was able to figure out which one of them was best suited for me, which she did based off of everything I told her I wanted. And after 2 months, Oribella was chosen!! Next was the nerve-racking part, how to get a tiny Cirneco from Bronte, Sicily all the way to Washington, DC. I was not able to fly there to get her myself, so somehow she had to come here to me. Diana had it all figured out: she had a courier ready to fly all the way to the US and hand deliver baby Oribella. She handled all the paperwork, the translating, and made sure everything was easy and organized. A few short weeks later, Lyuba (the courier) handed me Oribella at the airport and we were on our way home. In the 5 hour car-ride home from the airport, Oribella slept on my lap the entire time with no discomfort or hesitation. She immediately took to the family and even better, the house! She already knew her bathroom was outside and to respect all of the rules of the home. Diana thoroughly prepared her with such care and attentiveness. 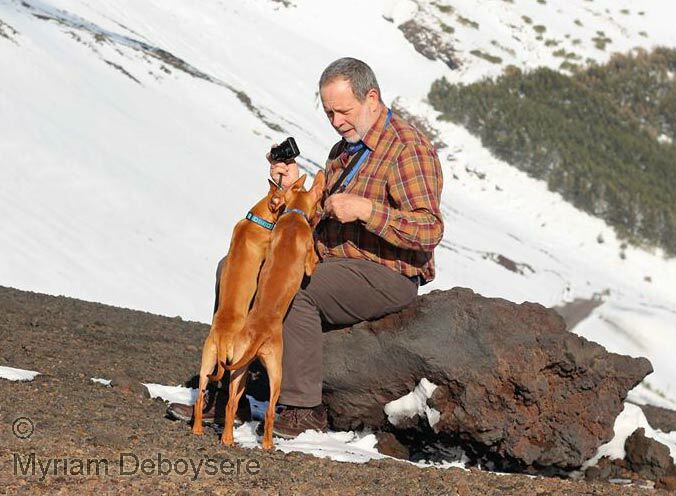 In short, you will not find any other Cirneco dell’Etna kennel like Diana’s. From giving me an outstanding introduction to the breed to raising my pride and joy to be the beauty she was when I first held her, Diana genuinely cares for her puppies and you. Months after bringing Oribella home, she still surprises me each day with just how smart and receptive she is. She learns faster than any dog I’ve ever met and loves any and every one she meets! She’s a true gem and I have Diana and her family to thank for that, I am forever grateful. First of all I have to thank you from Louis for your friendly hospitality and the big effort you gave to teach Orso the first months of his life. He did get a very good start ! It's a beautiful, friendly dog, willing to please his family. He's really adorable ! Yesterday-evening already everything went very well. At the airport I noticed very good Louis and Orso already had a bond. At home we put Orso in the bench so meeting the other dogs was relaxed for everybody. Later the evening I let Torr meet Orso in the room. Orso was a little afraid, but Torr did fine. He stayed with me when I saw Orso was afraid so Orso could make contact when he wanted himself. He already knew the bench as his safe place. Not a problem to get him in the bench. To finish yesterday we went for a walk with Orso and Torr , where Torr walked of leash. He behaved as a big brother for Orso. The night was not one problem. He slept till 6.30u, when Louis lett him out. After breakfast we went for a walk with al the 4 dogs. And it was very good with all 4 of them. Orso could walk side by side with every-one of them. It was a busy day for Orso. Besides shopping we spent some time in the garden and went to take care for the sheep. When the sheep where eating he did have a run with Torr and by himself and he follows Louis everywhere. It's nice to see. I'm sure Orso will be a perfect match in our pack. Good luck with your newborn litter and thanks again for doing such a good job with Orso! Нет ничего лучше на свете, когда находишь в этом мире, своего человека и друга! В питомнике мы приобрели друга Лаго и познакомились с очень светлым человеком- Дианой! Хочется выразить благодарность Диане за то, как она относится к своему делу! Мы очень долго ждали нашего нового члена семьи Лаго! Несмотря на то, что он родился далеко от нас, благодаря фото, которые Диана высылала нам регулярно, мы подрастали вместе с ним. Отдельное спасибо за то, что Лагуша приехал к нам социализированным щенком! Приучен к поводку, адаптирован к улице, городу, шуму и машине. Спасибо за переписку, инструкции, советы и поддержку! Благодарим за то, что уделяете внимание каждому щенку, учитывая их характер и особенности! Мы очень счастливы и благодарны Диане и её семье за то, как они воспитывают, кормят, ухаживают за животными! За её профессионализм и отношение к своему делу не как к холодному бизнесу, а как семейному делу! Именно такое отношение сыграло важную роль при выборе питомника. После первого письма Дианы, стало ясно, что в этом питомнике дом и семья! Лаго передает привет маме и всем своим родным!!! Желаем Вам и Вашему Дому тепла, процветания и новых друзей! Всем солнечным членам семьи здоровья! Lena is the second Cirneco who jumps into our lives. As we have already a Cyrenensis family member who met all of our expectations and we appreciate to have some support and advice of the breeder when needed. We did not hesitate one second to have the second 'Cyrenensis' Cirneco. One detail, we thought, would be a bit of a burden... The kennel is now situated in Sicily, far away of our tiny country, and the puppy wouldn't get into our hands before the age of 15 weeks due to strict EU legislation on rabies vaccination. Since the day the puppies were born we received pictures and regularly updates on the litter. We were able to follow the development of puppies very well as if they were growing next to us! The choice between the 4 adorable small girls was not easy… All and each one of the pups had a great expression, they are open, curious, raised in a family and all are very well socialized. Each one of them is the best in something and all have great perspectives to develop into the most wonderful creatures, being far away and not able to visit the pups often. We were happy to be able to count on the reliable advice of Diana to make the right choice for a puppy. Decisive factor for us it was the personality! 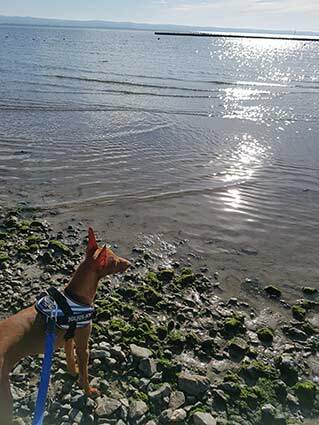 As our Cirneco would be part of our family, we preferred to have a calm and social personality, exterior being of less importance, but without any eliminating defaults, as we thought to take her to dogshows once in a while, and healthy, of course! For us no brave ringleader and for sure not the most independent or dominant dog of the litter. We were looking for a calm, well balanced, confident, yet brave enough and very social dog. Diana advised us very well, describing each of the puppies. Although, we have to admit. It is quite hard to see them growing into a small personality far away, and it is rather scary you cannot meet the puppies to learn their personality. And what seemed to be a burden, well we did not feel one second the distance in between us and our growing puppy...We recognised all of the characteristics and were surprised how well we knew her already, as if she has always been with us, it was a confirmation for our trust in the kennel Cyrenensis! Grazie mille for our Lena! And thank you very much for the hospitality to welcome my daughter and wife in Sicily. proud owner of a real Sicilian Cirneco Lena ! 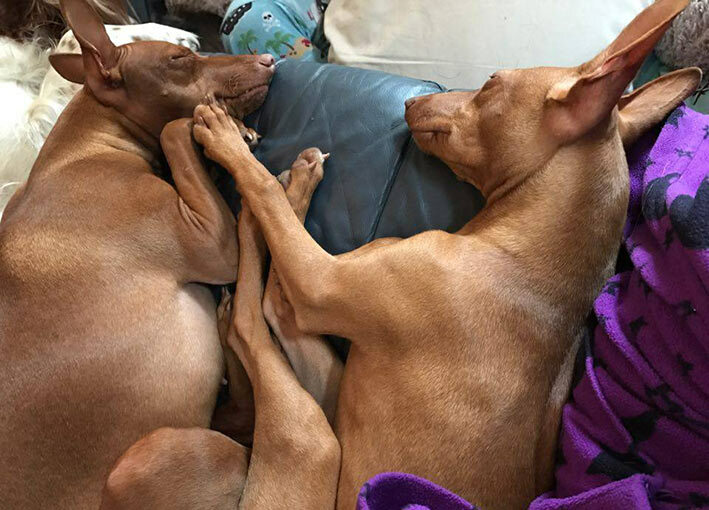 At the moment there are 3 sleepy dogs in our house - Frida and Bettina accepted Nora very, very well ! Last Monday our trip began - we spent 2 days in Nuremberg and 2 days in Cologne, then we went to Belgium. 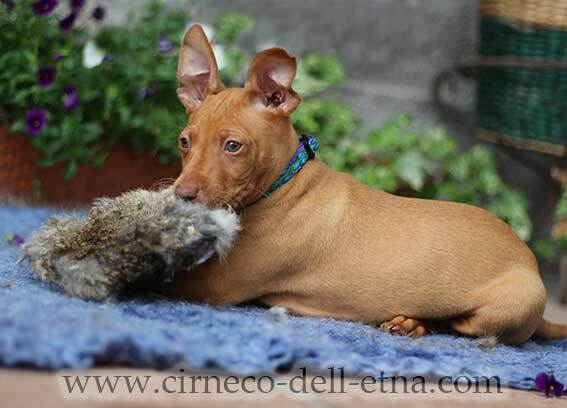 Ever since I've seen a photo of a Cirneco dell'Etna, I've been in love with this breed. 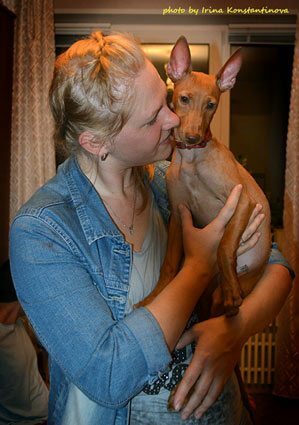 I found kennel Cyrenensis through the internet and decided to email them - since the first email, I got more and more information about the breed, photos, explanations, because Diana does not hesitate to share her knowledge and love for Cirnechi. Diana and Jackie accepted us beautifully! We met their dogs, we talked a lot, I think I learned a lot about this breed, they prepared WONDERFUL food, they took us to the beach, to Brugge, we met other owners - they were great hosts. I am very grateful. I was also very happy to meet Myriam with Mira Tina, Pascale and Staf with Ezzo and Henzy... Such a nice group of people with lots of positivity and love, not only for their dogs, but the world around them! Cyrenensis kennel puts health, love and beauty on the first place, they raise puppies with no concerns about money, because for them, dogs do not mean business, but pure love - always providing what is BEST for their dogs. Puppies are very well socialised, live in the house and are used to noises, walking on leash, other dogs, other animals and visitors. I also highly appreciate completely honest communication about any subjects concerning their dogs! Norushka is such a happy dog. She was so kind to us, the minute we met! On our way back home we slept in different hotels and she didn't cry even a bit. In the car, there were no problems - she slept the whole time or chewed bones. 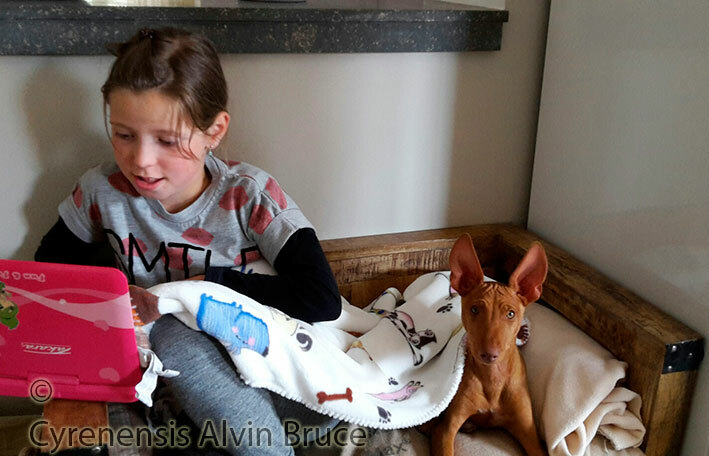 With getting my dear Cyrenensis Nora, I did not only get a beautiful, happy and healthy dog, but also great friends - breeder Diana and also other owners of their dogs, who are always happy to get news, give advice, all of which creates a wonderful positive community of kennel Cyrenensis. Выражаем глубокую и безмерную благодарность заводчице Диане Елисовой за нашего мальчика. Диана, словно творец, создает свои неповторимые уникальные, единственные в мире шедевры , одним из которых является наш Макс- пес в котором сплелись воедино внешняя грация, неповторимая красота и непостижимая доброта, невероятная доверчивость и любовь к людям, обезоруживающая раз и навсегда нежность и ласковость, вызывающая удивление сообразительность, понятливость. Диана, как заботливая мама опекала, оберегала, любила и терпеливо растила Макса до его отправки к нам. Регулярно отправляла нам фотографии, на которых видно было как Максимус взрослеет, как счастлив он и любим. И уже расставшись с ним по прежнему продолжает переживать за его судьбу, старается помогать нам его правильно растить, воспитывать. И эта поддержка просто неоценима. Спасибо. I have always been attracted by cirnechi, even though I only met one when I was a teenager in Sicily. It was, I think, love at first sight (if you can say that of a dog). I left Sicily and Italy too, but when we, as a family with children, began thinking of having a dog in our home, I went back to that day when two amber eyes were staring at me. We began looking for a kennel of cirnechi but there are not many! When we found Diana we were immediately struck by her hospitality and her love for cirnechi. We were at first invited to go and meet a cirneco, see how they behave, ask as many questions as we wanted. The answer to our visit came at night by our little girl: “Mamma, when can we go back to Diana to stay with those dogs who wanted to play with us?” . That was it! We followed Era’s pregnancy with the words and pictures that regularly Diana sent us and as the puppies were there we were invited to go. Puppies were born at home so they were familiar to humans. 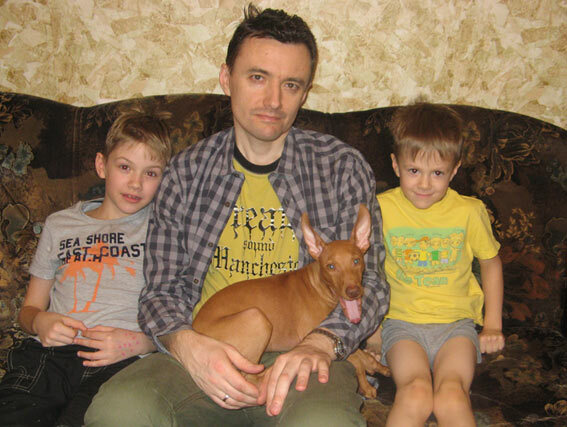 And, when the time arrived, Diana helped us choose the puppy with the most tender character, more suitable to live with children. It’s been 2 weeks now that Milo is with us and it’s a joy for our children and a surprise to see how fast he can learn and how intelligent he is. Thank you so much Diana! And see you again for our next meeting with cirnechi! I'm glad to be the owner of Cyrenensis Mira Tina. Tina is a Cirneco masterpiece with a very nice character. You did a great job raising her to a healthy, well socialised and, for her age, very well educated Cirneco! Tina grew up in house, between other Cirnechi. The best start she could get. We were always welcome to visit the dogs, even before mating, and puppies as soon as they were born. At least weekly we received nice pictures since the mating until Tina came home. I want to thank you for the open communication and all advice already given and of not at least for all time and energy invested in raising Tina! If you are looking for a social and healthy Cirneco you should look no further! Diana is serious breeder with knowledge of, and respect for the qualities of the breed ,never hesitating to share knowledge or give advice. Хотелось бы сказать огромное спасибо Диане за те труд и любовь, которые она вложила в воспитание нашего Анубиса. С ней можно договориться буквально обо всем! Идет на встречу, делает все, что от нее зависит, и даже больше! Нам пса привезли в Германию! Положили ему в приданное пеленочку с маминым запахом и кучу вещей, без которых ему в дороге было бы не комфортно! Что хотелось бы сказать о нашем Чуде... Он прекрасен!!! Видно, что ухожен, вскормлен качественным кормом - шерсть блестит, перхоти нет. Психика абсолютно здоровая, он игривый, контактный и очень позитивный щенок! Единственное, мы были слегка не готовы к такой бешеной активности и очень удивлялись, как же жить, когда их несколько?! Очень радует, что пес самодостаточен и с легкостью остается во дворе один, не скулит, не лает, всегда находит себе занятие. Хочу выразить благодарность заводчице Диане Елисовой, за то что к нам приехала абсолютно социализованная собака, не смотря на такой долгий путь и стресс, вызванный сменой места, Лучика виляла хвостом и была рада нашему с ней общению. Вот что еще поразило так это то, что щенок в свои 2 месяца уже знал команду «нельзя», был приучен к ошейнику и поводку, в городе вела себя спокойно, никаких неудобств не доставила ни при переезде (а это сутки в машине, сутки еще на международной выставке), ни уже дома. Ночью спит спокойно, не тревожит других обитателей дома. У собачки "железная психика" (не случаются приступы страха или агрессии) и отменное здоровье (переоклиматизация прошла практически незаметно). Люча живет в семье с 2 маленькими детьми и еще одной собакой- американским стаффордширским терьером. Теперь даже и представить не могу, что она не всегда жила с нами, маленькое солнышко, фонтан хорошего настроения! Аврора просто супер!! очень энергичная!!!! очень красивая, такая яркая!!!!!!!!! Очень культурная, дома писает только на пеленку. Ольга, Кристина и Наталья Ауловы. г.Казань. доброжелательный к детям нрав, миролюбивость, острый ум, простота в уходе, крепкое здоровье - все это присуще нашей чирнеко дель этна Нэрджи. Трудно найти более ответственного заводчика, который так тщательно и аккуратно организовал процесс транспортировки собаки в далекий Узбекистан. Очень радует чуткость и отзывчивость Дианы, всегда идущей на помощь в любых ситуациях, связанных с уходом за собакой. We (Pascale and Staf) are very pleased that we have bought a puppy from you. From 1 week old they were, we were already invited to come and look at the puppies, and we were always welcome to come back, to see the puppies again. What important was for us, puppies were raised in house and not in kennel what was good for the socialization of the puppies. And it was also nice that we have seen both parents what is truly exceptional. And they are wonderful dogs! In other words We are very proud of our puppy EZZO that we bought from you I would say keep it up and we wish you much success now and in the future.